Bundle of the Day is our mystery subscription service. If you — like us — love a good surprise and love getting them on the regular, subscribe to a Bundle of the Day and receive a mystery bunch of seasonal flowers, hand picked and put together by our team, at a frequency of your choosing. Select this product to receive a bundle of the same floral variety each time, but a different variety every delivery. Single variety blooms make for a simple but arresting centrepiece for your home, and is a great way to be introduced to the various floral types, to understand their nature, how to care for them and appreciate the nuance of each bloom and foliage. Subscriptions are delivered either weekly, fortnightly, or monthly on a fixed day of your choice any time between 10am to 7pm. Your subscription flowers will be a selection of the freshest flowers in season at the time. For this reason, we are unable to commit to any colour or variety in preparing the order and you should expect your flowers to vary from delivery to delivery. If you have any floral allergies, please do let us know and we will do our best to avoid including these blooms. Please trust that we will make every effort to send you beautiful flowers that we know you will enjoy! 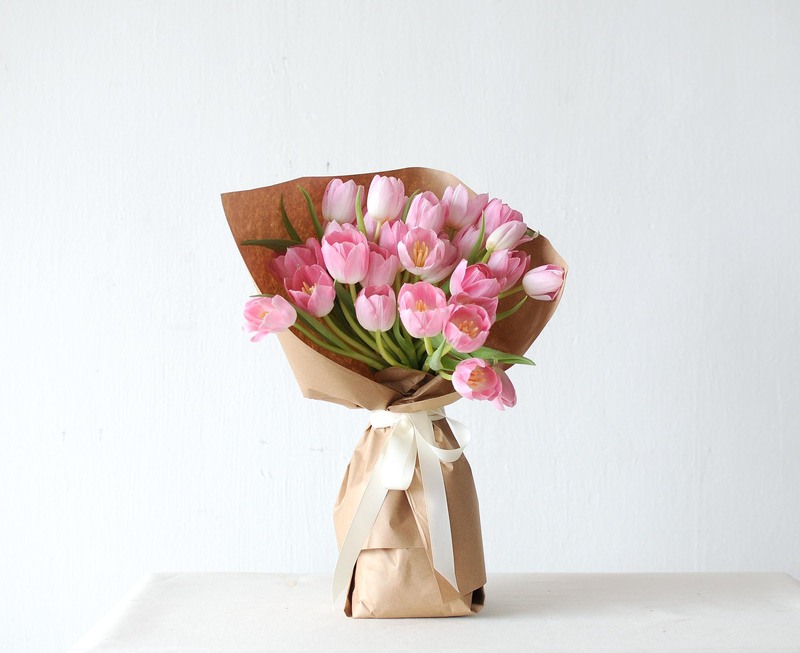 The bouquet is wrapped in a bag of fresh water to ensure freshness in the delivery process. Upon receiving the bouquet, extend its lifespan by placing it in a cool environment, away from direct sunlight. Also, change the water in the vase and snip a little of the stems daily for a fresh surface area to better absorb clean water. No frills, just flowers. If you’re purchasing flowers for your home or putting together your own arrangement, we recommend this minimally-packaged option. You will receive the flowers already conditioned and ready to be placed directly into a vase. However, market-bundled flowers will not come with a water bag so select this option only if you have an available source of water at your location. Bouquets come wrapped in brown paper with a water bag. This ensures sufficient hydration for the flowers so that they remain fresh between the time it is put together and when the recipient receives it. Single variety bouquets make for an impressive gift, and is perfect for showcasing the unique beauty of the variety chosen. Pick this option if you’re gifting the bouquet to a special someone. The most hassle-free option, all you need to do is find an empty spot to display your flowers. Great as a housewarming gift, or for someone starting on their floral journey so that they can reuse the vase for other arrangements. These flowers are available for next-day delivery at a fee of $12 per delivery address. Place your order by 4pm the day before to have your bouquet ready for collection or delivery the next day. A same-day delivery service is also available, if you require flowers at short notice. All same-day delivery orders will be dispatched from our studio by 4pm for arrival by 7pm; delivery charges are at $25 per delivery location. Same-day delivery orders must be placed by 12noon on the day of delivery. Self-collection is available at any of the following locations at the times stated below. Do note that self-collection is not available for same-day orders. Subscribe to a repeated order of these flowers to receive it at a frequency of your choosing! Simply check the box labelled “I would like a repeated delivery of this arrangement” and select the number of deliveries you would like. Your first subscription order will be delivered to you on the date you have selected at the time of Check Out. Your subsequent subscription orders will be delivered to you on the next occurring day of the week you have selected, in the frequency selected. For example, if you opted to have your orders delivered to you weekly on Monday, we will deliver your second subscription order to you on the next occurring Monday that is at least a week after your first delivery date. Thereafter, the third and subsequent deliveries will be completed weekly every Monday. Do note that all subscription orders (Bundle of the Day, bouquets and single variety flowers) will only be eligible for Standard Delivery.